Nathan (a.k.a. Mr. Husband) here. 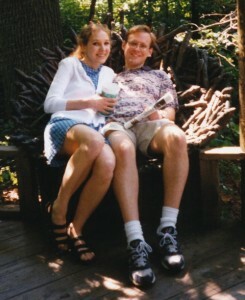 Yesterday Anna told you ten facts about me to celebrate our tenth anniversary. I happen to know the password to her blog, so today I am hijacking it to share with you ten facts about her. She works hard to tell stories. Being an author is a dream come true, but not an easy job. Anna works hard, almost all the time when she is not doing something with our daughters. Seven days per week, her goal is to write a thousand words or more in the morning and then to revise and do research in the afternoon. When not working on her own books, she is reading others’ works trying to figure out what makes them good and how she can learn from them. When she is doing other tasks, her subconscious is constantly working, and she often has to dash to her computer to jot down ideas. She really loves to tell characters’ stories. Deadlines are not necessary to motivate her. She delivered her last book something like a year ahead of schedule. I was a somewhat serious person once long ago. Of course I was silly as a kid, but I tried to tone that down in high school and college. All that changed when I met Anna. 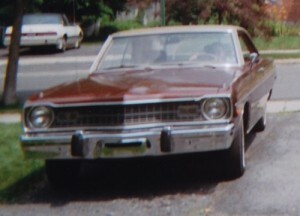 She mentioned yesterday that I bought a 1973 Dodge Dart before we were married. When I first showed her the car, she asked me what its name was. “Ummm, the Dart?” “No, I mean its *name*.” “Dodge Dart?” Clearly I wasn’t getting it. She informed me that her mother and she had discussed it and thought that Buster was a good name since it was brown in color. (Buster Brown was a comic strip character used in shoe advertisements, get it?) So, I called my car Buster, reluctantly at first, and only around her at first. Now I can discuss “exercising Buster” with my father, with a totally straight face, and we each know what the other means. This was fun until it came time to part with an object that we had been anthropomorphizing for years. I tried to put a stop to it after Anna felt bad sending Dexter to Appliance Heaven. We actually donated him to an appliance repair shop so that his parts and refrigerant might live on. But, it continues. Twilight of Avalon was written on Gus the G3 (a Macintosh that was roughly nine years old at the time). I’m afraid I have to take credit for that one. She is not very assertive. An example of this was her job as an editor/researcher for an amiable nonagenarian who hired her to help with a a screed about what the U.S. is doing wrong with its policies on currency. His confusion due to his advanced age meant that the project went in circles with little real progress made. Feeling increasingly bad about taking his money for this Sisyphean project, Anna resolved to call him up and quit. After the phone conversation, Anna walked into my office and said “I’ve signed on indefinitely.” Apparently immediately upon answering the phone and without waiting to hear why she was calling, the gentleman had launched into a speech about how grateful he was to have her help and how much finishing the project meant to him. She was finally rescued from the project by her pregnancy with our first daughter. Her lack of assertiveness comes from her placing a higher priority on others’ happiness than on her own. Do something unjust to a third party while she is around, and you’ll find out pretty quickly that she *can* be assertive on others’ behalf. She was *this close* to becoming a serial killer. When she was a child, she saw a raw chicken packed in flexible plastic at a grocery store. She was poking at a pool of its blood and various bits through the plastic and looked up at her mom to ask what it was. Her mother explained that it was a dead chicken. She looked thoughtful a moment, and her mother expected her to get upset about the chicken. Instead she said “Can we buy a chicken and make it dead so I can play with its blood?” She has since grown out of this. She may not be assertive, or often think of herself, but she thinks for herself. She was the first (and only) person of my age cohort that I ever heard claim not to like the Simpsons. We all watched it in college. You could literally walk through the dormitory from corner to corner and hear, unbroken, the dialog from the Simpsons because every room that had a TV had it tuned there, just like the Lawrence Welk Show in a nursing home. The Simpsons was hilarious back then. Something in each episode to entertain everyone at every level from a kid to a scientist. Well, Anna didn’t find it funny. She was looking at it more deeply than most of us and thought that the focus was too much on laughing at and sometimes even celebrating faults in the characters. She likes things that focus on developing character rather than laughing about a lack thereof. It is just a trivial example of the many, many issues where the masses are going one way, but Anna, after careful thought, is going another. She doesn’t often fall for the advertising agencies’ attempts to make her think she needs product X to be happy, or that Photoshopped model Y is the definition of beauty, or that bogus statistics W show Z to be true. She caught one email scam that even I, Mr. Suspicion himself, didn’t. She is usually right. But I still like the early Simpsons. In science and engineering, we usually select singular or plural by asking “Is the quantity exactly equal to one?” If yes, use singular, otherwise use plural. 1 meter. 1.1 meters. -10 meters. 0 meters. My brain works analogously for other things, like number of people. Jim is. Jim and Jill are. Jim and three-quarters of Tom are. None are. I did this for two decades of my life, and nobody complained. But then I married a writer. Someone who knows that the origin of “none” is “not” + “one.” You wouldn’t say “not one are,” right? I may have the usage note in the dictionary and a thousand years of history on my side, but at our house, it is “none is.” Got that? I would compare our marriage to a fortress defended by two soldiers. When we shoot, it is outward at threats, not at each other. Friendly fire incidents are rare. She considers my happiness and hers to be not only of equal importance, but one and the same. We are happy or sad as a unit. As far as I know, she can’t leap over buildings, but she does have a couple uncanny powers. The one I want to share is that, well, she closes things. She is The Closer. Post offices, museums, national monuments, libraries, nothing is safe when she is near. Posted hours make no difference. I first noticed this phenomenon during our first day trip together. We set out with a number of possible tourist destinations, planning to go wherever whim dictated. 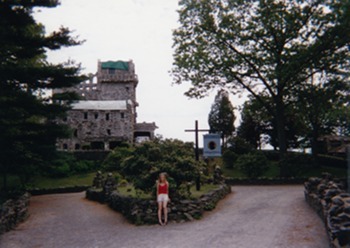 We first drove to Gillette Castle. It was closed for repairs, but, no worries, we walked around the grounds for a bit and then set off again. We decided to check out the USS Nautilus Museum. We arrived to find it crawling with admirals who were there for a ceremony. It was closed to the public for the day. We set out eastward for Mystic Seaport, RI. We got massively delayed in traffic and arrived just as it was….. closing. Gillette Castle not being open. 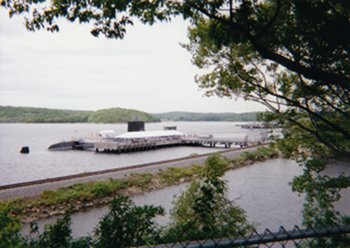 USS Nautilus not being open either. We didn’t immediately realize that this effect emanated from Anna. But careful observation over the years has shown that it is in fact Anna’s mere presence. Even after our recent move to the DC area, she leaves a trail of closed businesses and institutions in her wake. We often drive to neighboring counties to use their libraries, and she actually forced the closure of a particular library (at least 30 minutes away on a good day) three times in a row despite our having carefully researched its alleged hours of operation. In fact President Obama considered using a visit by Anna to close down the detention center at Guantanamo Bay. *That* would have been interesting. Anna was once asked by an interviewer what she considers her best personal quality. Being too modest to answer, she asked me to field the question. I immediately answered “patience.” In almost every area of her life, she has had to show what to me is an amazing amount of patience. From dealing with prolonged sicknesses to waiting for her slow poke husband to finally finish his schooling to the odyssey from aspiring to published author, she has waited patiently and day by day worked toward health, success and happiness. She lived for years on a diet that I could not have stomached for a week. She wrote six novels, each time exhausting the roll of literary agencies in her genre. Each time she had to reluctantly give up on an idea and a cast of characters that had become very dear to her, accept that one to two thousand hours of her work would never earn her anything but experience–and more importantly to her, never be widely shared with other booklovers. And then start over with a blank word processing document and a fresh tower of research books on a different era and locale. She never hesitated to take that first step of each thousand mile journey, even after five destinations in a row were mirages. She lived through a period when even her survival was in question, and now she is the happy mother of two flourishing girls who has a great publishing contract working with people she loves to share stories she loves with readers she loves. She did it step by step, day by day, without shortcuts, without cheating, without losing heart. I am indescribably happy for her. Her husband is the luckiest guy ever. Thanks for ten great years, Love. I now return control of your blog to you. This entry was posted Thursday, June 10th, 2010 at 5:45 pm and is filed under Uncategorized. You can follow any responses to this entry through the RSS 2.0 feed. You can leave a response, or trackback from your own site. Awww this is really too sweet. My hubby and I can’t relate to the punch line in most married people jokes either.